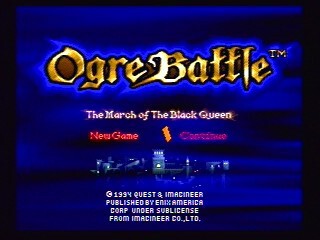 The 1993 tactical roleplaying game Ogre Battle: The March of the Black Queen has the player take up the lead of the Liberation Army, fighting to free the continent of Zetegenia from the clutches of the Empress Endora. With a gritty portrayal of the reality of war and the plentyful choices throughout the game's 29 levels the player can explore up to 13 different endings to the story. Best 100% time with Best ending: Single-segment 2:10:24 by Tony 'Brootus' Robertson on 2013-02-27. My brother Ray, for encouraging me to do this and for buying/figuring out all the technical aspects of recording/encoding. I have the patience for 1000 ogre battle runs, but not researching tech stuff. My buddy and boss, Nick, for introducing me to speedruns and encouraging me to do this one. And for helping me plan/test my route at work when business was slow! Thanks, Nick! even!) and hosted my ogre battle speedrun party! Thanks, Ted! My girlfriend Lydia, who fell asleep not once, but twice while trying to watch me/help me do a speedrun! It's ok, hun.. you tried. At least you let me spend 2 months with ogre battle instead of with you! To the creator of http://www.twsrv.net/ogre/, a site which has been around since 1996! My main source of research and my main inspiration to become an ogre battle fanboy. Thanks, fellow MOTBQ-lover! To legendary member of the SDA community, Dragondarch, for giving me route suggestions and generally encouraging my speedrun! It's like having Steve Nash help you with your foul-shot. Thanks, Dragondarch! On to the game... I wanted to do a single-segment run that did not rely at all on luck or RNG manipulation to be successful. I spent about a month planning my route, and another 2 weeks running through the route for the best time. I probably lost 1-2 minutes with seconds of menu-navigation errors throughout this run, so it could technically be stronger in that area. There is an embarrassing mistake on Ruins of Balmoria where I waited a fraction of a second too long to move a unit which caught me in a game of pong between two enemy units, running away until i broke free. Looks bad, but didn't actually hurt my time by more than 30s or so. At first I thought this embarrassing moment would cause me to not submit this run, but upon further reflection... it's rather funny. Another embarrassing moment was on the boss fight of Valley of Kastro. I meant to change tactics to "leader" but I went too far and ran away from the battle. Only a 5s error, but... looks bad. Anyway... those are my only two serious player-errors, so for a pretty long game, I'm satisfied with that!